Question: What do you folk think of open hole flutes? Is the sound REALLY any better with open holes? WHY do so many high-level professionals play open hole flutes? I would LOVE the real INSIDER knowledge here! Thanks, guys! H.
Answer: Probably not, but the open-hole design has become popular, especially in North America, and flute players are still very much divided on the topic of plugging open-holes to facilitate ergonomics. The inventor of the modern flute, Boehm, felt that closed keys were superior. 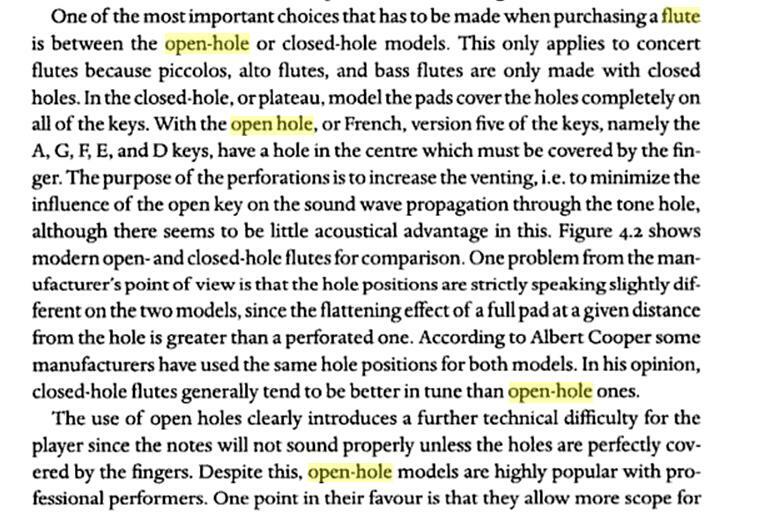 Marcel Moyse played closed hole, and flute maker Albert Cooper suggested, in designing his "Cooper scale" that it's probable that open-holed create more tuning problems then they solve, but the jury is still out on exactly what open-holes do. The flute community is even divided about what plugging open-holes does to the tone and the pitch. I think plugs that are shallow and air-tight don't adversely affect the flute, but until some truly scientific tests are done on "identical" flutes with and without perforated key cups we all have to do our own experiments. Flute companies still build their top models offering both key styles. 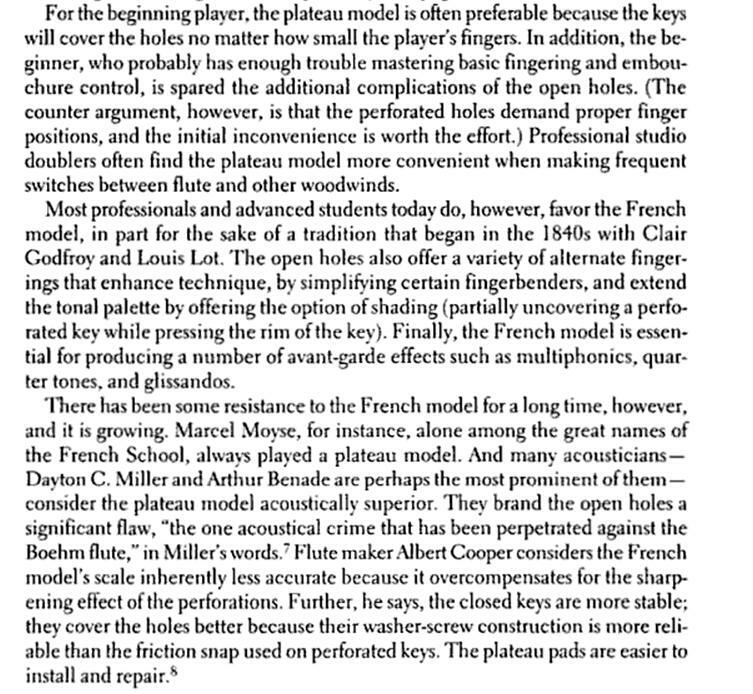 But in certain parts of the world plateau style keys are "special order" and disallows a flutist from trying many "identical" flutes and choosing the best one. But whether or not open-holes really make a positive difference is a topic that has long been discussed and debated. No one has yet proved that the tone quality is affected by the air exiting through the open holes in the keys. Many flute builders believe that the key heights must be incrementally increased by fractions of a millimeter if you have plateau (closed) keys to allow proper venting for tone and tuning. You have to try for yourself and see what suits your needs. First because this has become "the fashion", but in modern times because open-holes allow more use of extended techniques and special fingerings for specific uses (tuning, harmonics, special effects.) professionals want to be ready willing and able to play this music. Summary: You can use closed hole if you prefer and not play contemporary music; quite a few professional performers have used closed hole and played standard repertoire. However if you wish to play contemporary or avantgarde music, or have the option of special fingerings for colour changes, then you will need an open-hole flute. "And one is far more likely to find English music college students playing on closed-hole, C-foot flutes, crippling their ability to exploit the full range of the flute's beauty -- simply absurd in this day and age." If you are going to use modern sound techniques and extended techniques that require half-hole fingerings, multiphonics, slides, 1/4 tone glissandos etc. you cannot perform these on a closed hole flute. "2.1.27 What kind of flute option is best, open or closed-hole?" Note the above text: According to Albert Cooper "closed hole flutes generally tend to be better in tune than open-hole flutes". Now when were those pitch tendencies measured and on what brand of flute? Hmmmm......inquiring minds need to research further. I use an Altus (Bennett scale) open hole flute with short acrylic hole-plugs in all but the F-key. Open hole flutes are more numerous in North America, and you can fully test them, unlike special-ordering a plateau or closed-hole model and not knowing if you like the flute until after it has been specially delievered to you. I'd rather use plugs than go with an un-played special-order flute.. If I need special half-holed or shaded fingerings (for tuning in orchestra) or to play extended technique pieces (using half-holing or rim keys only ) then I would have to remove the plugs. After testing minutely and carefully with a tuner, I found the only pitch descrepancy was on E2 at pianissimo where the difference that plugging the open-holes made on the bendability of the pitch was less than 1 cent on the tuner.